There are a few articles floating around out there about a garden revolution in the front yard, but somehow I feel they don’t go far enough. I understand that swapping out a lawn for raised beds is already a sea-change for many folks (and their Homeowner Associations) but I’d like to encourage us to make that extra step toward welcoming everything that lives in a garden, even the ones we can’t see. Maybe especially the things we can’t see. 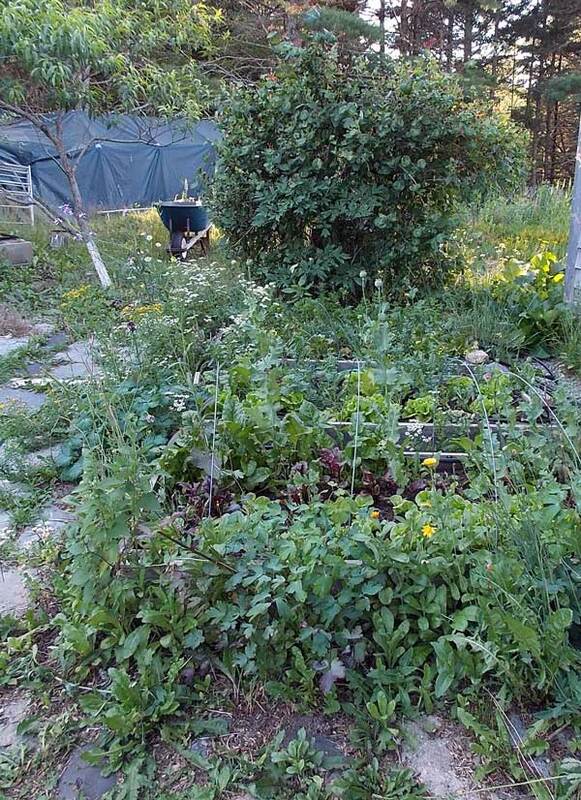 It’s difficult to structure a raised bed to readily welcome fungi, soil organisms, minute insect life, and opportunistic seed growth, but any old patch of dirt will prove a living welcome mat for all those things if you just leave room. I’ve come to understand that organized garden beds are really for the humans. We like to keep inventory and we’re easily distracted so we plant what we want to keep in neat rows and discard the rest. Moving toward the idea that our choice edibles grow best when hidden from predators and mulched against extremes of weather, here’s a set of photos matched up with a list of what has been planted amidst the chaos in my yard. This section of the front yard contains: amaranth, Kentucky Pole and Scarlet Runner beans, daylilies, witchhazel, rhubarb, peas, crabapple, tomatoes, potatoes (4 varieties), sweet corn, persimmon, pumpkins, cucumbers, winter squash, willow, sour (pie) cherry, quincy, lingonberries, cranberries, plum, comfrey, grapes, and allium. The side yard, and along the path to the driveway: dill, madder, strawberries, tomatoes (5 varieties), parsley, carrots, leeks, garlic, one pumpkin plant (I guess I lost track), grapes, willow, elecampne, hosta, gunnera, astilbe, blueberries, cecephalus, and just off to the right of this photo, plum, apple, tree peony. 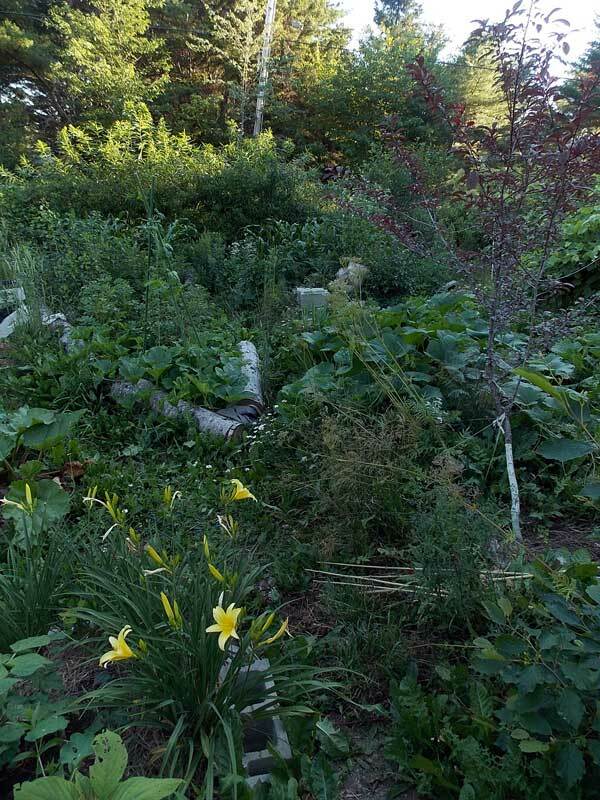 In Maine parlance this is the dooryard – just down the steps from the front door: edible dandelion, calendula, columbine, mullein, anise hyssop, golden beets, Bull’s Blood beets (grown for the ruby-red foliage); yellow Australian, Red Sails, Winter Romaine, and Thom Thumb lettuces, assorted mustards, bergenia, feverfew, tatsoi, senposi, minutia, poppies, and honeysuckle. Therefore, a manifesto to gardeners everywhere (and with apologies to Freemasons), chao ab ordo! 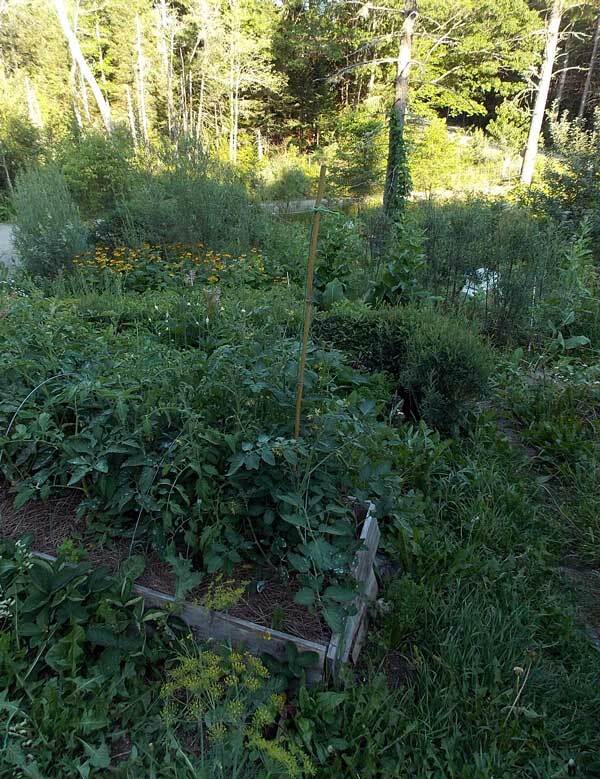 This entry was posted in gardening, horticulture, Maine, permaculture, the backyard, Uncategorized and tagged garden, summer on July 20, 2013 by APo.